Edmund and Harriet Greenway had a large family of five boys and five girls, born between 1827 and 1844 in South Bersted in Sussex, and I've developed quite a fondness for the five Greenway sisters, who include among their number Rebecca, my greatx2 grandmother. Unlike most of their brothers who stayed nearer home as they followed careers at sea, the girls escaped from the seaside to the much wider world - and gene pool - of domestic service in London. Ellen Greenway (1831-1883) Ellen was baptised as Eleanor in South Bersted on the 23rd of January 1831. In 1841, still at home, she is 10. By 1851 Ellen, now living in London, was in a relationship with Isaac Watson, a gardener, with whom she'd had two children, who both died in infancy. Banns had been called for their marriage in Hammersmith in 1849, but they didn't get married until 1852 in Fulham, and they had a daughter, Alice Rebecca, born in 1853 either in Bognor (according to the 1861 census, Ellen could have gone home to give birth) or Kensington (according to the 1871 census). She was baptised on the 13th of February 1853 at St Barnabas in Kensington, when the family address is given as Edwarde's Square Lodge, and Isaac is a Gardener. The death of an Isaac Watson was registered in Kensington in 1856, possibly a son, but probably her husband as in 1861 Ellen is living with George Sparrow Field as his wife at The Lodge, Stroud Green, Hornsey. George is 25, a Coachman born in Great Baddow in Essex, and Ellen is 27, and born in Bognor. There is a daughter, Georgina, aged 1 and born in Hammersmith, and living with them is Alice Watson, a niece, aged 9, and born in Bognor. I have found no record of George Field marrying Ellen Watson, or indeed, any Ellen. If she was a widow there would have been no reason for them not to get married, but living together as they did hints at the fear of bigamy. So did Isaac die? Or had George already briefly married and separated? Was Ellen actually Georgina's mother? Then there was the problem of how to describe Alice, hardly Wife's daughter or Step-daughter if George and Ellen weren't actually married, so Niece is a compromise. Ellen and George went on to have two more sons: George Valentine was born in Carshalton in 1864, and Charles Arthur in Dulwich in 1869. In 1871 the family is living in Newton Valence in Hampshire, and with them is Alice Watson, visitor, age 17, born Kensington. It was the existence of Alice that made the link between the two Greenway sisters, Ellen and Rebecca, for when Alice married William George Webb on the 17th of October 1880 in St Marylebone the witnesses are Eliza and Alfred Jeffery. Rebecca's daughter Harriet Eliza (so Alice's cousin and my great grandmother), also known just as Eliza, had married Alfred Jeffery on the 1st of February 1880 in Rotherhithe, and taken up residence at his pub, the Wilmington Arms, 20 Yardley St., Clerkenwell. I'd already had a suspicion of this connection from the marriage of Harriet Eliza's brother Joseph. I knew he had married a Georgina Field on the 24th of August 1884, and that her father was George Field, a Coachman. From the 1861 and 1871 censuses I could see her mother was an Ellen born in South Bersted, or Bognor in the early 1830s, and I had a missing Ellen Greenway … could have been a coincidence of course. Now however it turns out that Joseph Paver and Georgina Field were cousins. Joseph Paver and Georgina had four children: Georgina born in Southwark in 1887 died there the following year; Joseph George born in Southwark in 1889 died in France in 1918; William was born in 1891 in Walthamstow and died there in 1892; Ellen Rebecca (neatly combining the names of her two Greenway grandmothers) was born in Walthamstow in 1892 and married John Wright there in 1912. Rebecca Greenway (1834-1869) Rebecca married Joseph Paver in Hammersmith in 1853. He worked as an oil seed miller and he'd travelled down from Hull with an old friend, John Campleman, and the lives of the Greenways, Pavers and Camplemans became inextricably linked. I've written more about the Pavers and the Camplemans here. Eliza Greenway (1837-1906) Eliza, by the early 1860s had chosen to move further into London, and she married Leonard Jelly on the 5th February 1861 by licence in St. Peter, Pimlico. The witnesses were Henry Limpkin and her sister Alice. Leonard gives his occupation as Valet, and his address as Ashford in Kent, her address is Eaton Square. Despite being married they are living apart at the time of the 1861 census: Leonard is working for the Finch-Hattons at Eastwell Manor, near Ashford in Kent, and Eliza still with the surname Greenway, and claiming to be unmarried, is working as a servant for James Hooke, a butcher in Frederick Street, St Pancras. Between 1862 and 1864 Leonard got a new post in Scotland, and by the time of the 1871 census the family is living at Weirston Gate, on the Eglinton Castle estate, Kilwinning in Ayrshire. Leonard is a footman and they have four children: Leonard Edmund (born in England in 1862), Harriet, Jane and Alice (all born in Kilwinning). There had been another son, Harry, who had been born in 1864 but who died in 1868. Son George was born here in 1871, but their next three children William, Robert and Victoria were born in New York, where, according to the 1880 census, Leonard was working as a grocer. Leonard died in 1890 and Eliza in 1906, the only one of the sisters to make it into the 20th century. Charlotte Greenway (1840-1866) Charlotte Greenway (born in 1840), who was still at home in Sussex in 1851, was, by 1857, like Ellen and Rebecca, in Hammersmith when she married Henry Limpkin, an oil seed miller from Louth in Lincolnshire. Sarah Campleman, John's wife, was a witness at her wedding, and in 1861 the Limpkins and the Camplemans are sharing a house in Hammersmith. Charlotte and Henry's oldest son, Henry had been born in 1859 in Stratford in Essex, which suggests at least a visit to her sister Rebecca (who had moved there with her family between 1857 and 1859) perhaps for the birth. Charlotte died in Hammersmith in 1866, and Henry quickly married again (to Charlotte Price) as he had a very young family with a new baby to support. Alice Greenway (b. 1842) If Eliza was the longest-lived and most-travelled of the Greenway sisters, then Alice the youngest sister is the most elusive. Although she witnessed her sister Eliza'a wedding in February 1861, she can't obviously be found on the subsequent census. She married Lewis Lloyd Meredith on the 6th September 1862, and neither of the witnesses are her family members: had they all moved on, or did they not approve or know? Lewis Lloyd Meredith was born in Shrewsbury on the 13th August 1838. His father Lewis Meredith was a retail and wholesale grocer and hop and seed merchant with a large and apparently successful business. He was born in Llanychaearn, close to Aberystwyth in Cardiganshire, and his father Thomas, was a farmer. Lewis moved to Shrewsbury and was already established in the town when he married Catherine Lloyd in Llanaber, near Barmouth, on the 6th August 1832; they had altogether nine children, of whom Lewis Lloyd was the fourth, and second boy. Lewis senior was a mason, and also for a time a town councillor. In January 1838 his warehouses in Wyle Cop, opposite his shop and residence suffered a calamitous fire. While some of the contents were insured with the Shropshire and North Wales Assurance Company, his policy was made void by the storage of the hazardous materials and equipment used in candle making. The company did however make him an ex gratia payment of £350, though how far that went towards making good his loss ... 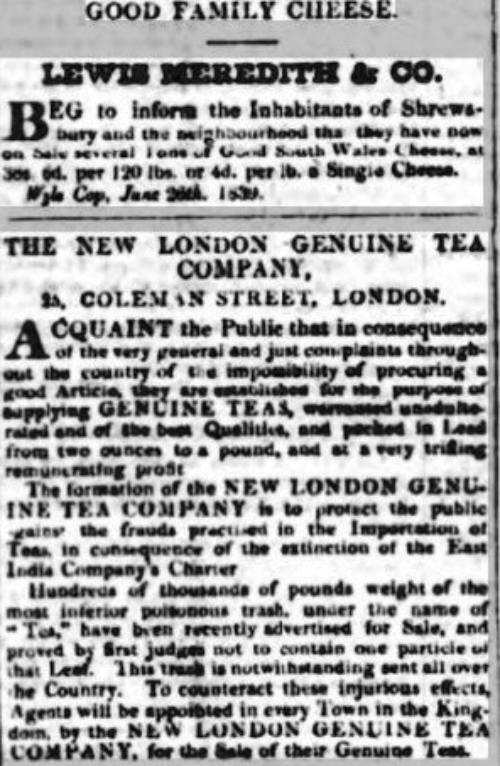 He was at great pains to assure his customers that he would continue trading as usual, and within a year he was advertising "Good Family Cheese" and announcing that he was an agent for the New London Genuine Tea Company. 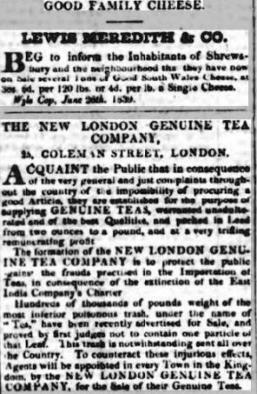 (Shrewsbury Chronicle 05 July 1839) All this was to end on the 5th March 1858 when a petition for adjudication of bankruptcy was filed against him. According to newspaper reports of some of the legal proceedings, he owed in excess of £3000. He must have known that this was imminent as on the 19th February 1858 he advertised his house and business premises "also a yard and range of capital stabling in Beeche's Lane" to be sold or let. His stock and shop fittings at Church Stretton and at Wyle Cop in Shrewsbury came up for auction on the 4th and 5th March, and all of his household furniture on the 8th March. On the 18th June there was a huge sale of his "valuable and extensive freehold and leasehold business premises, cottages, and land, shares and policy of assurance"; the properties were in Shrewsbury, Bayston Hill and Dorrington; the policy of assurance was for £1000 "payable on the death of Mr Lewis Meredith, now aged 54 years". He had of course to resign as town councillor. The effect on the family must have been disastrous, and in 1861, though still living in Saint Julian Friars in Shrewsbury, Lewis is now a Commercial traveller in Seeds and Hops, and advertising manure to agriculturalists in the local papers. At home with him are his wife Catherine, and children Catherine, Ellen and James. Lewis died on the 8th December 1866, and by 1871 his son James (now married to Martha) is the grocer. Other members of the family - children Thomas, Eliza and Jane - are in London in 1861 living with Lewis's brother John in Westminster. Lewis Lloyd Meredith (born 13th August 1838) was the best educated member of the family, and in 1861 he is lodging in Kenilworth and gives his occupation as Teacher of Classics and Mathematics. Eighteen months later on the 6th September 1862 he married Alice Greenway in Pimlico. He says his occupation is tutor, while his address is probably his uncle John's in Westminster (Alice’s is Ranelagh Square); one of the witnesses is his brother, Thomas, who has the occupation of Clerk in the 1861 census. He says his father is (still) a Hop merchant, while Alice's father, Edmund has been upgraded to a Builder. In June 1865 Lewis, a Private tutor, and Alice are living in Brighton, at 12 Hampton-place, when he too is adjudged bankrupt. On the 27th February 1870 Lewis and Alice are in Kensington to witness the marriage of his brother James to the widowed Martha Harvey (née Arnold), and in the 1871 census Lewis and Alice (now given the middle name Selina for the first time) are living at 2 Aminta Cottages in Fulham, with his uncle John, and Lewis is a Classical tutor. This is the last time Alice appears in the official record, for in 1881 Lewis is living and teaching at Dulwich House in Norwood, south London, as an Assistant schoolmaster. Aged 41, he says he's married but there is no sign of Alice anywhere. Lewis died on the 5th September 1887 at Fisherton Anger lunatic asylum near Salisbury, from phthisis and pleurisy; the certificate describes him as age 47 (49 actually) and a tutor from Fulham, London. Uncle John Meredith had married Ann Mackley on the 3rd June 1839 in Westminster. He gives his occupation as Surgeon and his address as 10 Chapter Street, St John the Evangelist. His father Thomas Meredith is a farmer; her father James Mackley is a Tailor. In 1841 he is living with his wife Ann in Chapter Street, he is 40 and not born in Middlesex, she is 41 and born in Middlesex. As the occupations columns on these pages seem to contain just unreadable initials - if any content - it's hard to say what he does. In 1851 he is still living at 10 Chapter Street; aged 59 he is Proprietor of house, born in Cardigan, South Wales. His wife Ann is aged 50, a Fund holder born in Westminster St. John. By 1861 he is a widower living at 34 Chapter Street (his wife Ann had probably died in 1858); aged 68 he is a Fund holder, born in Cardiganshire. Living with him are three of his brother Lewis's children: Thomas, 20, a Clerk; Eliza, 18, Housekeeper; Jane, 10, at school. By 1871 he’s living in Fulham with his nephew Lewis Lloyd Meredith and his wife Alice. I can’t find him or Alice in the 1881 census, but John Meredith died in Fulham at 10 Ellerslie Road, Shepherds Bush on the 20th March 1886, an Annuitant, aged 94. This address is a private house in both 1881 and 1891 so it probably was at the time of his death; the informant is an E. Baker, so not Alice. The mystery is that he doesn’t seem to have left a will of any sort. But as a childless widower whose siblings had all pre-deceased him (and who all came from somewhere remote in Wales), perhaps he did leave a will which was never proved as his probable sole heir and executor was in a lunatic asylum. There is no obviously appropriate death or marriage recorded for an Alice Meredith, so I wonder what happened to her. She doesn’t appear with other family members, so did she run and change her name to re-invent herself? She’s not alone: most of her husband’s siblings and cousins seem to vanish into thin air too! It is interesting to see who can and who can't sign their names. In 1852 Ellen Greenway could not sign the marriage register, while Isaac Watson, a gardener, could. In 1853 Joseph Paver could sign, while Rebecca Greenway could not (and she wasn't 23 either!). In neither of these weddings is another family member a witness. In 1857 Charlotte Greenway could sign and so could Sarah Campleman (as a witness), while Henry Limpkin (the other witness) could not. In 1861 Leonard Jelly and Eliza Greenway both sign, and so does her sister Alice as a witness; the other witness, Henry Limpkin still can't sign his name. When Alice married Lewis Lloyd Meredith in 1862, they both sign, and neither of the witnesses are Greenway family members. By 1851 Rebecca and Ellen had left home, and it would seem as though their younger siblings received a better education. Though it hadn't done much for their youngest brother William. The only boy in the family not to go to sea, in 1861 he is living with Joseph and Rebecca in Stratford; when he married Ellen Daley in Limehouse in 1864, neither bride nor groom could sign. Nor can one of the witnesses, Edmund Greenway, presumably his father.